Spot the spoiler. Dracula’s Daughter (1936) movie poster. Picture: Universal Pictures; It’s Craptacular!. Welcome to the eighth instalment of “Virgin’s View,” where I review a classic vampire film without being exposed to any background information or reviews, hence the term “virgin.” Beware spoilers ahead! 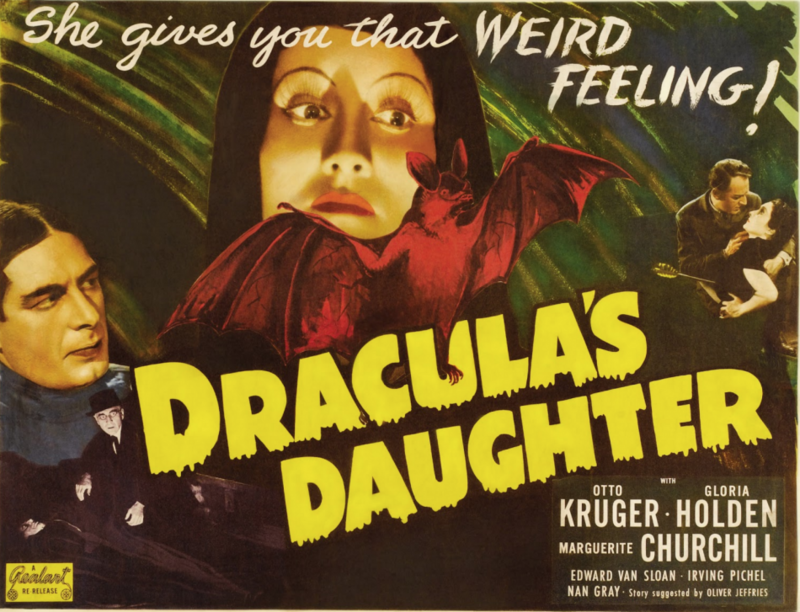 Dracula’s Daughter (1936), a Universal Picture, was directed by Lambert Hillyer and starred Otto Kruger, Gloria Holden and Marguerite Churchill. Double homicide: The movie opens with two perplexed police officers who stumble across upon what looks like a double murder. Picture: Universal Pictures; The Bela Lugosi Blog. The movie starts out in the middle of a supernatural crime scene as two bobbies descend down a dark spiderweb-laden stairwell searching with their torch only to discover a listless body at the bottom. An familiar old man, emerges rambling about murder. The cops discover another body, but this one is a vampire branding a stake through his heart. The fuzz cuff the old man and haul him off to Scotland Yard. For a brief moment, I think how fantastic it would be if Sherlock Holmes was assigned to consult on the case. Scotland Yard confirms my suspicions that the old man in custody is Dr. Van Helsing (Edward Van Sloan). The Commissioner, Sir Basil Humphrey (Gilbert Emery), interrogates the doctor and gets a summary of the entire Dracula novel/movie in about two minutes. Van Helsing covers his entire vampire escapade including Dracula’s trek from Transylvania to London, the boxes of earth, and random victims being drained of blood. Basil is skeptical and expresses there is no way his city has or will be overrun by vampires. He tells Van Helsing, who openly admits he murdered Dracula, that he’ll either be committed or sent to the gallows. Van Helsing demands the commissioner send for Dr. Jeffrey Garth (Otto Kruger), an old student of his, who is now a shrink. He feels he did humanity a favour by staking the vampire and has no doubt about his own innocence, hence the reason for the doctor not a lawyer. 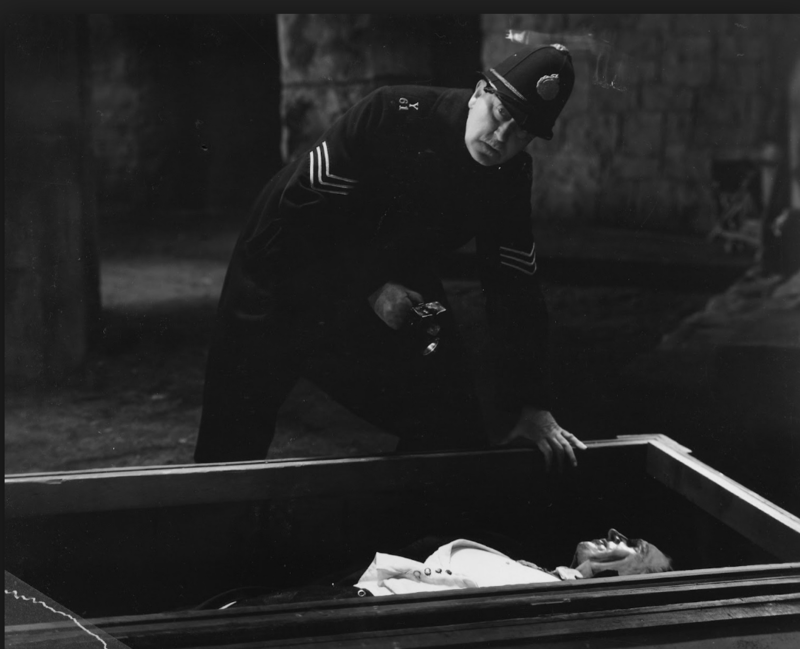 A mysterious lady wrapped in a long black cape (Gloria Holden), shows up at the Whitby police station and demands to see Dracula’s body. The bumbling bobby on duty denies her entry. She pulls a True Blood maneuver and “glamours” him with her giant tacky ring and piercing stare before stealing the corpse for a barbecue. How do you like your stake? 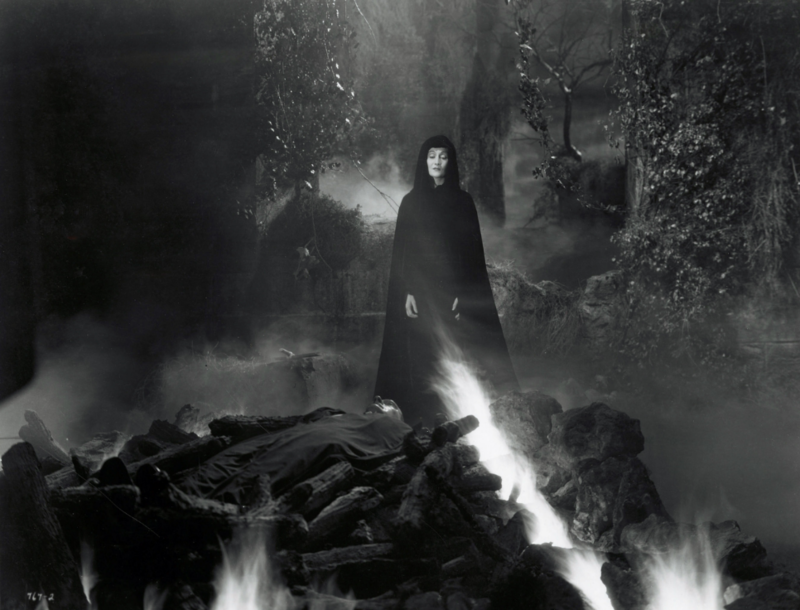 The “mysterious lady wrapped in a long black cape” cremates Dracula’s body. Picture: Universal Pictures; The Bela Lugosi Blog. The woman chars Dracula’s body to a crisp and does a little chant in Sam and Dean Supernatural-exorcism style. Excitedly, she returns home and explains to her manservant, Sandor (Irving Pichel), that the evil spell is now broken. He disagrees and explains he still sees death in her eyes. This leads to a little discussion about “twilight” and “lullabies,” which totally made me laugh as I thought back to Edward and Bella. Before morning she creeps out for a snack and uses her signature move again. She hypnotizes a complete stranger and runs home to give her blood stained dirty laundry to Sandor before jumping in the coffin for the day. Janet Blake (Marguerite Churchill) drives out from London to the moors to pick up Jeffrey before he engages in a fox hunt. She explains he has been summoned by Scotland Yard to help with a case concerning his past professor, Dr. Van Helsing. Jeffrey immediately heads back to London with Janet and vows to clear Van Helsing’s name. The mystery woman finally reveals her identity at a dinner party where Janet and Jeffrey just happen to be; she is Countess Marya Zaleska, who strolls in and quickly becomes the centre of attention. She tells her audience “I never drink…wine.” For back then, it was a funny one-liner to drop. Jeffrey discusses Van Helsing’s vampire theory and instantly gets her attention. He explains that anyone with obsession issues can be cured if they release their mind. She plans a date with Jeffrey to discuss the subject further and right away I could see where this is going. Despite Janet’s jealous reaction, Jeffrey meets the countess at her place and comments there are no mirrors. He discusses addiction and uses alcoholism as an example. He says fighting the urge is the key and you can see her wheels turning. She thinks Jeffrey can fix her vampirism since cremating Dracula didn’t cut it. Later that night the countess visits her art studio in Chelsea. Sandor goes out to find her a model and waits by the river. He creepily approaches a young blonde (Nan Gray), takes her back to the flat and then the tacky ring comes out again. The next day, the blonde is found wandering the streets and admitted to the hospital. Through hypnosis, Jeffrey makes some discoveries and when he sees two puncture marks on her neck, he realizes that Van Helsing may have been right all along. Scotland Yard thinks that Dracula may have faked his own death in Whitby and is now killing in London. Van Helsing disagrees and explains there could be other vampires. He reminds Basil and Jeffrey about boxes of earth and no mirrors. Then, Jeffrey’s wheels start turning. Jeffrey tries to get the countess on his hypnosis machine made of mirrors. She freaks out and explains she is leaving the continent that night forever, but would like him to accompany her. Jeffrey says no and she gets pissed. Sandor kidnaps Janet for leverage. The countess hopes Jeffrey will trade his life for Janet’s. Jeffrey tracks down the countess in her studio. She admits to being Dracula’s daughter and gives Jeffrey the slip. He then hops on a plane to Transylvania and finds her in Dracula’s castle. The silly bugger goes alone and confronts her. He barters with a local to get a ride to Borgo Pass and hoofs it the rest of the way. The countess’ end game is let Janet live only if Jeffrey becomes one of the undead so they can then spend eternity together. She figures if she can’t get rid of the curse, she might as well have some man candy on her arm. Two’s company, three’s a crowd: Countess Marya Zaleska (Gloria Holden), Sandor (Irving Pichel) and Dr. Jeffrey Garth (Otto Kruger) stand off. You could cut the tension in the room with a knife. Picture: Universal Pictures; Wrong Side of the Art!. Sandor doesn’t take the news of the countess offering another man the dark gift lightly. He says what about your promise to me? I think someone is a little jelly. This made me think back to the film What We Do in the Shadows (2014) where Deacon (Johnathan Brugh) promises to turn his familiar Jackie (Jackie van Beek), into a vampire. He prolongs the transformation for years and instead makes Jackie his domesticated slave who takes care of dry cleaning, dishes, housework, appointments and finding victims. Sandor takes matters into his own hands. As Jeffrey arrives, he tries to shoot him with a crossbow and misses. Cold heartedly the countess explains to Sandor it is her castle, her rules and to deal with it. She offers Jeffrey eternal life. He calls her crazy and turns her down. Armed with his trusty crossbow again, Sandor surprises me and shoots the countess in the heart. I guess if he can’t have the dark gift, no one can. She dies, Janet comes out of her coma, and Jeffrey shoots Sandor with his gun. The calvary from Scotland yard arrives just in time to clean up the mess. All’s fair in love in a crossbows. Instead of going for the typical stake through the heart this film mixed things up a little bit. Picture: Universal Pictures; Steve Hoffman Music Forums. I think whoever was the marketing wiz that thought up the tagline for the cinema poster should have been fired. “She gives you that weird feeling,” isn’t exactly the best way to put a spin on a vampire movie. Not to mention they show how she is offed right on the poster. Talk about a spoiler alert! When we first got introduced to Dr. Van Helsing, I jumped back to my Virgin’s View on Dracula and double checked it was the same actor from the intro credits. Funny enough, it was, which in my eyes makes this a sequel of sorts or a fan fiction spin off like the Twilight saga has endured. The movie starts with Dracula dying, we meet a familiar face, add in a few new characters and boom, we have a sequel. Is it really? I have no idea yet. The dysfunctional relationship between Jeffrey and Janet reminds me of the one between Cary Grant and Rosalind Russell in His Girl Friday (1940), one of my favourite films. Jeffrey bosses her around, Janet exhibits bouts of jealousy when he is hangs out with the countess and they crack jokes all the time. The two have a definite spark between them. You don’t really know how deep it runs till the end, when Jeffrey is willing to give his life for Janet. Another character that stood out to me from the film was Sandor; his facial features instantly reminded me of Benicio Del Toro. I don’t recall Del Toro ever playing a vampire, but I could be wrong. I remember he starred in The Wolfman (2010). 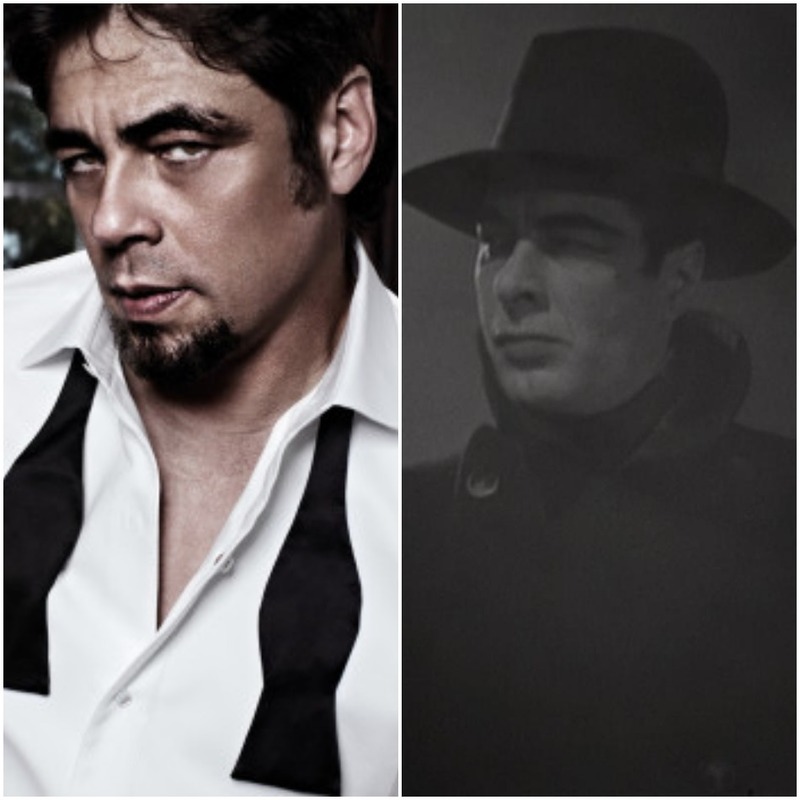 Twins: Could Benicio Del Toro and Irving Pichel be long lost blood relatives? Picture: (L) Flip the Movie Script. ; (R) From Midnight, with Love. Photo montage by Anthony Hogg. As with some of the older vampire films, I am noticing a pattern. We are shown next to nothing for the gore factor, which I guess can be attributed to the era. I was surprised at how quickly the film climaxed and finished. Everything was over in about two minutes. I remember looking at the clock and thinking there wasn’t much time left to wrap it up. Besides films, this was similar to how quickly Bram Stoker’s Dracula was done in a matter of a couple of paragraphs. Perhaps this was done intentionally back then? After having seen a few Dracula classic films now, I enjoyed how this one strayed away from the norm and expanded the story, giving the vampire an extended family and not just the usual “vampire brides.” Bare in mind the countess only tracked down dad’s dead body to try and rid herself of the vampire curse. The countess spends the entire movie trying to figure out how to rid herself of the curse and finally gives up for what she thinks is love with Jeffrey. Little did she know, love was staring her in the face the entire time and Sandor would have spent an eternity with her. She scorned his love and ended up dead. So much for being in the friendzone. I enjoyed this movie because it changed things up, making it less predictable. It would be interesting to explore why the countess needed an inanimate object like her ring to aid in hypnosis, when Dracula simply used his eyes and voice. The costumes were classic and portrayed 1930’s elegance just right. For scenery and backdrops, I think they didn’t try too hard like in some other films. Things were kept very simple and it worked for the film. Perhaps I will get to meet one of Dracula’s other relatives soon in another Virgin’s View, if he has any. 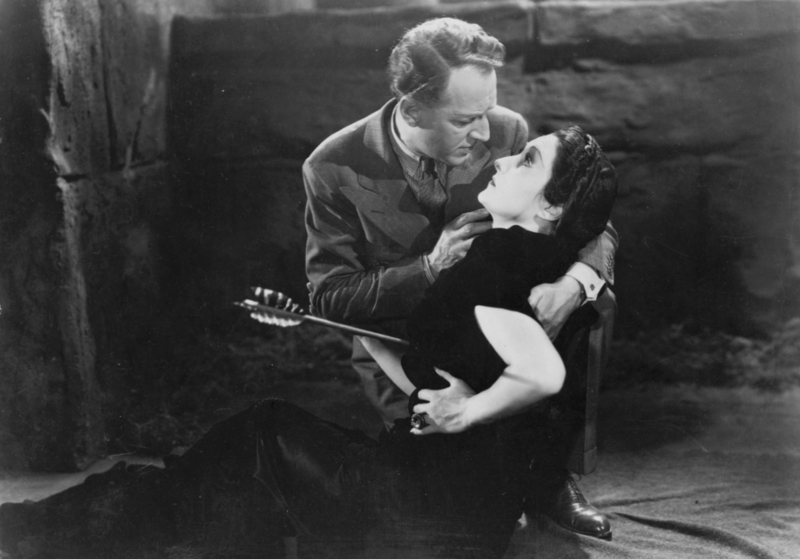 Virgin’s View on Dracula: Erin Chapman, “A Virgin’s View on ‘Dracula’ (1931),” Vamped, May 26, 2015, accessed Dec. 10, 2016, http://vamped.org/2015/05/26/a-virgins-view-on-dracula-1931/. For those curious, yes, this is actually a direct sequel to Dracula (1931). Not only does it pick up immediately after the first movie, but was also written by the same screenwriter: Garrett Fort (1900–1945). I’ve got no idea why Van Helsing’s name is changed to “Von Helsing” in this movie, though. Note also, Sandor uses a longbow, not a crossbow and the still chosen to depict the Countess’s death does not actually appear in the film. It appears to be cut from a publicity still, alternate or deleted scene. The version Erin watched is available on Internet Archive: https://archive.org/details/DraculasDaughter1936. And next… son of Dracula ! (one of the Universal-era movies dealing with dracula I enjoy the most). Anthony actually mentioned son of Dracula too. Perhaps that will be the next one! He chooses the films so his call 🙂 what movie is Melford’s? Browning and Melford movies were shot at the sime time (on during the day, the other during the night). But melford’s one was aiming spanish speakers. Son of Dracula is interesting in many thing, one of them being the first work about vampire occuring in Louisiana, long before Anne Rice. This is not a spoiler, this is even mentionned in the blurb of the movie ! 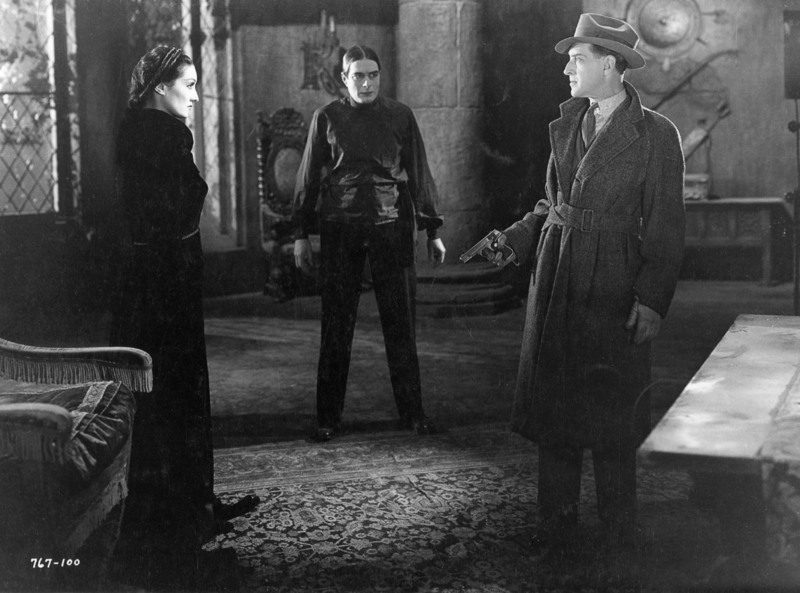 Erin, Vladkergan is referring to the Spanish Dracula (1931) that was filmed concurrently with the English version. We’ll add it to the list! Thanks Anthony! I know we looked before and weren’t able to find a copy to watch. That’s why I haven’t done this one yet. Perhaps we should try to search again?